ImmTech has extensive experience in the development and manufacture of kits and reagents for use in biodetection assays, including an antigen detection kit for the detection of Influenza A nucleoprotein, and a variety of substrates, buffers, and accessory reagents that can be used to enhance the performance of enzyme immunoassays (photometric as well as chemiluminescent), immunofluorescent assays and immunohistochemical assays. Influenza viruses can be divided into three classes, A, B, and C, largely based upon conserved antigenic differences in the internal nucleoprotein. Influenza A virus, typically encountered more frequently than types B and C, and associated with the majority of serious epidemics, can be further subdivided into strains or subtypes based on antigenic differences in the external hemagglutinin proteins (H1-H15) and neuraminidase proteins (N1-N9). A variety of wild waterfowl appear to be the predominant natural reservoir for Influenza A viruses and subtypes representing many of the hemagglutinin and neuraminidase combinations can be found circulating in these birds. Historically, human influenza virus infections have been associated with H1N1, H2N2, and H3N2 subtypes of influenza A, although a recent (1997) and significant outbreak in Hong Kong was identified as an H5N1 subtype. This outbreak was not only significant because it resulted in 18 human infections and 6 deaths, but it also represented the first known demonstration of avian influenza virus transmission to humans. Since the 1997 H5N1 outbreak in Hong Kong, additional outbreaks of different influenza A subtypes exhibiting bird to human transmission have been documented; H9N2 in Hong Kong (1999, 2003) and China (1999), H7N2 in The Netherlands (2003), and H5N1 in China (2003) and Southeast Asia (2003-2004). As a result of these outbreaks and other information, there is a significant concern that a human pandemic strain of influenza A could emerge. While Influenza A subtype identification is extremely important (vaccine production, epidemiology), the rapid and accurate differentiation of influenza A from influenza B and C and other repiratory agents in humans and animals is also important (treatment and biosecurity). ImmTech has developed a highly sensitive and specific enzyme immunoassay for the detection of Influenza A nucleoprotein antigen in complex sample matrices derived from both human and veterinary sources. The assay can be completed in less than 1.5 hr. and contains only one wash step. 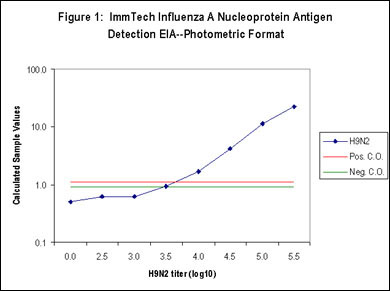 Serial dilutions of Influenza A, subtype H9N2, were tested in the photometric version of the ImmTech Influenza A Nucleoprotein Antigen Detection EIA. Absorbance values were converted to Calculated Sample Values according to the product insert, and plotted against virus titer dilutions (EID50/ml or Egg Infectious Dose/ml). The equivocal zone of the test is delineated by the Positive and Negative Cut-off values. In this assay, 10,000 EID50/ml of H9N2 were easily detected. 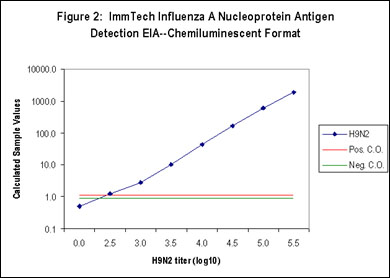 Serial dilutions of Influenza A, subtype H9N2, were tested in the photometric version of the ImmTech Influenza A Nucleoprotein Antigen Detection EIA. Absorbance values were converted to Calculated Sample Values according to the product insert, and plotted against virus titer dilutions (EID50/ml or Egg Infectious Dose/ml). The equivocal zone of the test is delineated by the Positive and Negative Cut-off values. In this assay, 300 EID50/ml of H9N2 could be detected. One hundred and forty-six samples from a regional poultry laboratory were first tested by embryonated egg inoculation and found to be negative for Influenza A. 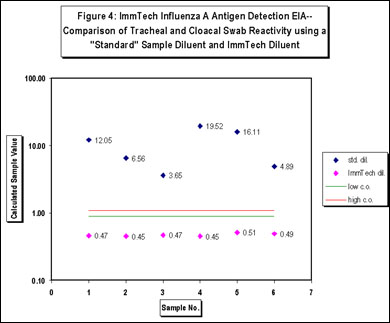 These samples were retested in the ImmTech Influenza A Nucleoprotein Antigen Detection EIA with and without the proprietary ImmTech Diluent. The results clearly illustrate the improved specificity of the assay using the ImmTech Diluent. 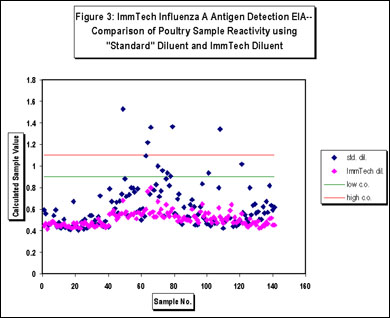 Twenty tracheal and cloacal swabs were taken from pathogen-free chickens and evaluated for reactivity with and without the proprietary ImmTech diluent in the ImmTech Influenza A Nucleoprotein Antigen Detection EIA. Six of the 40 samples demonstrated high levels of reactivity in the standard diluent, but this reactivity was eliminated using the ImmTech diluent. The ImmTech Influenza A Nucleoprotein Antigen Capture ELISA kits (IAV-1192, IAV-1480) are highly sensitive and specific semi-quantitative assays for the detection of Influenza A nucleoprotein in a wide variety of samples. To enhance the analytical utility of the ELISA kits, ImmTech has developed the Influenza A Nucleoprotein Antigen Calibration Kit, which permits the generation of a nucleoprotein calibration curve and estimation of nucleoprotein in a sample. The Influenza A Nucleoprotein Antigen Concentrate supplied in this product was produced using A/Beijing/262/95 (H1N1). The virus was grown in embryonated eggs, detergent-treated to remove the viral envelope and concentrated by centrifugation. Following SDS-PAGE, nucleoprotein concentration was calculated as a percentage of the total protein in the preparation. Influenza viruses can be divided into three classes, A, B, and C, largely based upon conserved antigenic differences in the internal nucleoprotein. Influenza A virus, typically encountered more frequently than types B and C, and associated with the majority of serious epidemics, can be further subdivided into strains or subtypes based on antigenic differences in the external hemagglutinin proteins (H1-H16) and neuraminidase proteins (N1-N9). A variety of wild waterfowl appear to be the predominant natural reservoir for Influenza A viruses and subtypes representing most of the hemagglutinin and neuraminidase combinations can be found circulating in these birds. Historically, human influenza virus infections have been associated with H1N1, H2N2, and H3N2 subtypes of influenza A, although a recent (1997) and significant outbreak in Hong Kong was identified as an H5N1 subtype. This outbreak was not only significant because it resulted in 18 human infections and 6 deaths, but it also represented the first known demonstration of avian influenza virus transmission to humans. Depending upon the serological requirements or research interest (natural infection, vaccine monitoring, or DIVA [Differentiation of Infected from Vaccinated Animals]), it may be useful to monitor the development of influenza A NP-specific antibody in a variety of species. ImmTech has developed a highly sensitive and specific enzyme-linked immunosorbent assay (ELISA) for the detection of influenza A NP-specific antibodies in serum from human and veterinary sources. Because the assay utilizes "inhibition of binding" technology, it may be used with serum from any species, and therefore does not require species-specific conjugates. The assay can be completed in less than 1.5 hr., contains only one wash step, and incorporates proprietary diluents that are designed to prevent the development of nonspecific signal derived from sample matrix and/or the nonspecific adsorption of reactive test components. The result is an assay that is both highly sensitive and specific.